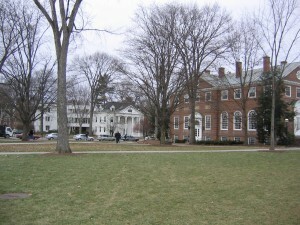 Mindy Kaling walked the ground of this college campus as a student. So who are the Ivy League stars? Have you seen Kate McKinnon on “SNL”? She graduated in 2006 from Columbia University. You know who also went to Columbia? Jenny Slate. You might know her from a year of doing “SNL” and for a role on HBO’s “Bored To Death.” What about Jane Lynch? Do you know her? Maybe you know her from “Glee.” After all, she is Sue Sylvester, an iconic television character of our time. Jane Lynch is a graduate of Cornell University. Jennifer Westfeldt from “Friends With Kids?” Yale University. Connie Britton of “Friday Night Lights” and “Nashville” fame? Connie is a Dartmouth College alumna. As is Mindy Kaling, even though her character went to Princeton in her FOX series, “The Mindy Project.” And, no, Ellen Pompeo did not attend Dartmouth, even though her character on “Grey’s Anatomy” did. That’s only because Shonda Rhimes attended the College on the Hill. Anyhow, hat tip to “Guest of a Guest” for the alma maters of some of these leading ladies.